During Goddess Month (17th July – 16th August), the energy radiating from the Supreme Shakti fills the earth plane and can give you special blessings and the ability to create good things in your life. Last Friday during Goddess Month is sacred for connecting with the power of the Goddess. 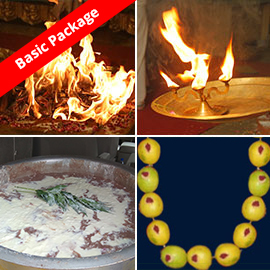 During the Last Friday, AstroVed will be invoking a unique form of Goddess Lalita Tripura Sundari for relationship blessings.On the last Aadi Friday, the raw archetypal energy of Goddess Sowbhagya Pratyangira will be invoked to root out negative influences and give multifold blessings for happiness and abundance. On the Last Friday of Goddess Month, special fire prayers will be conducted using a powerful mantra from the sacred text Lalita Sahasranamam (1000 names of Goddess Lalita) and each unique set of mantras will invoke unique blessings. On the Fourth Friday, Goddess Lalita is invoked in her form as ‘Shiva Shaktiaikya Roopinyai.’ In this form, she is the unification of Shiva and Shakti. The Goddess in this form can increase intimacy among couples and remove Dosha (affliction) affecting relationships. Mantra chanted during the Fire Prayer (Homa) – Om Shiva Shakti Aikya Roopinyai Namaha. 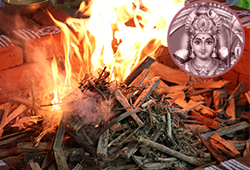 On the last Aadi Friday, the culmination energy of the Goddess in the form of Sowbhagya Pratyangira Devi is invoked through sacred Fire Prayers (Homa) at AstroVed Remedy Center. According to scriptures, performing sacred fire prayers invoking Sowbhagya Pratyangira, the ferocious Goddess, can destroy evil forces and negative energies, and grant a sturdy protective shield around you and your loved ones. During Goddess Month (17th July – 16th August), the energy radiating from the Supreme Shakti fills the earth plane and can give you special blessings and the ability to create good things in your life. Last Friday during Goddess Month are particularly sacred for connecting with the power of the Goddess. Invite the blessings of the Supreme Goddesses on Last Aadi Friday to resolve relationship troubles and gain all forms of wealth. During Last Aadi Friday, AstroVed will be invoking a unique form of Goddess Lalita Tripura Sundari for relationship blessings. On the last Aadi Friday, the raw archetypal energy of Goddess Sowbhagya Pratyangira will be invoked to root out negative influences and give multifold blessings for happiness and abundance. Invite the blessings of the Supreme Goddesses on Last Aadi Friday to resolve relationship troubles and gain all forms of wealth. Book your individual Lalita Sahasranamam chanting and Durga Suktam homa during Aadi Fridays to gain success, peace, and prosperity in life. Chanting Lalita Sahasranamam shall help remove the afflictions due to the influence of planets and the effects of evil spells. 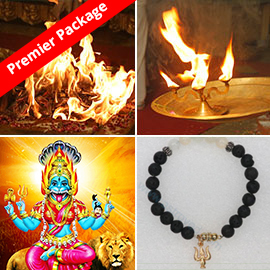 The powerful Durga Suktam homa would help you overcome physical and mental problems, remove obstacles and negative energy, and attain success in all endeavors. Order your Shakti bracelet energized in our Aadi Fridays power rituals to access the powerful energies of the Mother Goddess to eradicate negativity and lead a life free of suffering. You will receive the energized product, which will be blessed in the rituals. Keep this on your meditation altar and wear it during meditation or at other times to expand the Divine blessings into your life. 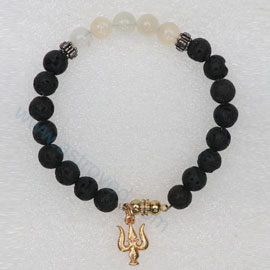 Order your Shakti mala with Trishul pendant energized in our Aadi Fridays power rituals. 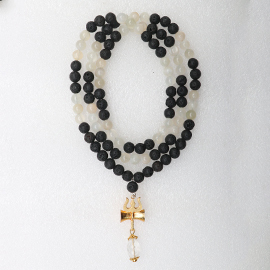 Wear it to connect with the Goddess to seek powers to defeat negativity, create positivity and multiply abundance.